Access Networks’ 2019 Event Schedule Packed Full with ACE Training, Buying Group, Regional, and Major Events | KMB Communications, Inc. Opportunities exist from coast to coast for Access Networks dealers to hone their networking skills and in turn, provide a better, more secure technology experience for their customers. Los Angeles, CA (April 15, 2019) – Access Networks, the premier enterprise-grade networking solutions provider for the modern smart home, announced today that is ramping up its presence at events in the field, such as buying groups and regional trade shows, as well as Access Networks Certified Expert (ACE) training, to best support the needs of residential technology integrators. From spec’ing, to selling, installing, and maintaining, the network can be the most challenging part of a project. As such, Access Networks developed ACE to give attendees the technical concepts and skills needed to confidently deploy, troubleshoot, and support robust, reliable, enterprise-grade networks. These one-day, in-person training sessions and labs are localized to the integrator. 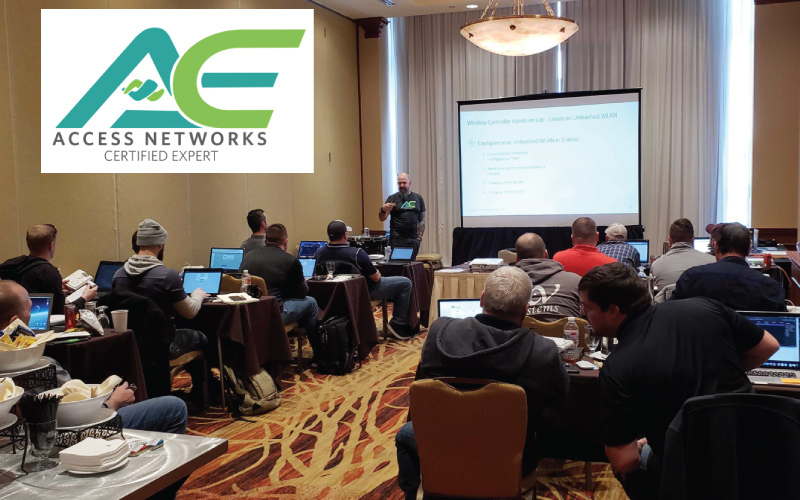 The first half of the day, Access Networks gives not only ACE students, but members of the sales and design teams the opportunity to attend informative sessions on product information, best practices for design, the basics of Wi-Fi, sales tactics, and a hands-on lab. In addition to attending ISE, the ProSource summit, CEDIA Tech Summit in Ft. Lauderdale, Azione Unlimited’s spring conference already this year, Access Networks is hitting the road for an expanded lineup of events throughout 2019. In the upcoming months alone, the company is offering several new MVP Dealer events and ProSource regional dinners, as well as attending the CEDIA Tech Summit in Irvine, California (April 23-25), ProSource Power Dealers in San Antonio (April 24–26), and CEDIA Tech Summit in Houston (May 21-23)—all in addition to its regional ACE trainings. Access Networks will also participate in CEDIA Tech Summit panel sessions discussing The Future of Technology. Interested in learning more about the next ACE training in your area or how to connect with Access Networks at an event? Please contact your regional rep for more information. Access Networks is the premier enterprise-grade networking solutions provider for the modern smart home. We design and maintain sophisticated network solutions based on a simple premise: keeping our customers connected. Access Networks assists custom integrators by working to specify, select, source, and configure the networking gear before it is shipped to the project site. From design and deployment to service after the sale, we are here to ensure our network solutions meet the bandwidth demands of today’s AV and control components and enhance the overall technology experience. Visit www.accessca.com and follow Access Networks on Twitter, Facebook, and Instagram to learn more.